Every moment of this revival of Lynn Ahrens and Stephen Flaherty’s Once On This Island touches the heart and rings true, from start – with the best “turn off your phone” reminder in recent history – to the happy/cry ending. 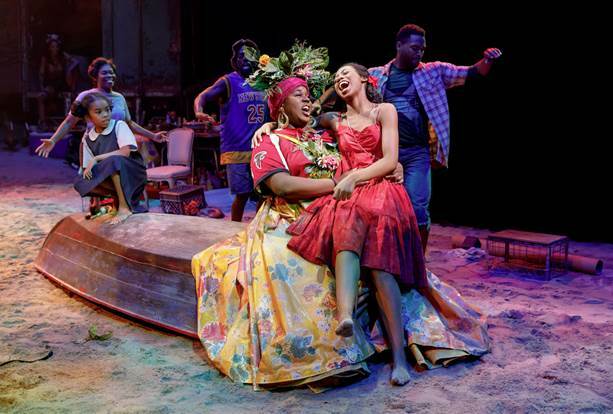 Splendid direction by Michael Arden evokes magical performances from everyone, from the Little Girl (Emerson Davis) to Papa Ge, god of Death (Merle Dandridge). You can feel the truth brushing against you like the wind from the hurricane that starts the story of Ti Moune. About that story: it may seem simple, but it’s got life, death, gods, peasants; family, community; faith, hope, despair; color and class consciousness, and the transformative power of love. That’s a lot to cram into 90-minutes/no-intermission. On one side of an island in the French Antilles live peasants “black as night”; on the other side of the island live rich, light-skinned grands hommes, descendants of the original planters and their slaves. 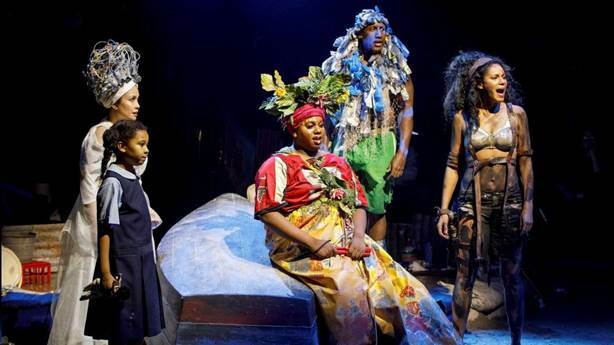 After a hurricane, peasants Mama Euralie (Kenita R. Miller) and Tonton Julian (Philip Boykin) find a little girl in a tree (Mia Williamson); they adopt her, and call her Ti Moune. Years later, grown-up Ti Moune (the astonishing Hailey Kilgore) pleads to the gods for a purpose for her life. 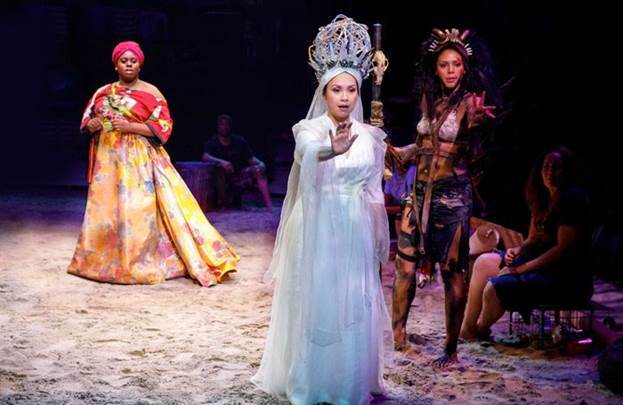 The gods argue among themselves; Erzulie (Lea Salonga), god of love, has faith in love, but Papa Ge bets that death is stronger. The test comes when an accident near Ti Moune’s village nearly kills Daniel (Isaac Powell) a grand homme. Ti Moune finds Daniel, nurses him, falls in love with him, and, when Papa Ge comes to take his life, promises to exchange her own life for his. When Daniel is taken home, Ti Moune follows him, to the despair of her family, but with the powerful protection of Asaka (Alex Newell), god of the earth. You know how this will play out; no surprises here. Although she has healed him and they are lovers, he can never marry a peasant, he’s engaged to someone else, sorry about that. Papa Ge appears to the enraged Ti Moune, offering her own life back, if she kills Daniel. She tries, but her love is stronger than death, and she cannot kill him. Daniel’s family throws Ti Moune out of the house; she remains outside the gates, waiting for him, even when, after his wedding, he leaves her there to die. After Ti Moune’s death, Asaka changes her into a tree that grows to crack open the gates of Daniel’s home, making it possible for both sides of the island to come together – peasant and grand homme may, sometime, love freely. Dane Laffrey’s smashing scenic design, with a set full of things to look at and discover, one that climbs up into the seats and crawls the walls, moves the cast, and the story itself, into the audience. Superb lighting design by Jules Fisher and Peggy Eisenhauer paint pictures and tell stories all by themselves. The music is splendid, not just Stephen Flaherty’s excellent score, but every tune sung, every trash can banged, every note played. Not only that, but the cast brings the orchestrations to life, singing as instruments, as well as actors. It’s subtle, beautiful, brilliant. Camille A. Brown’s choreography is dynamite, as is costume design by Clint Ramos – never has better use been made of a tablecloth. Once On This Island bends rules and makes new ones. Cheerful colors paint this sad tale of love and death. Songs of loss soar in bright melodies; the cast sings the orchestrations. Cross-gender casting works its own magic. Some absolute newcomers cast in key roles rock them with the poise of veterans. Go ahead, enjoy those bent rules. When the result is as divine as Once On This Island, you’ll be thrilled with the result.